« North Korea condemns Syrian attack, but did China get a message? Earlier this year, there was also a proposal from a New York Senator to allow the government to remove internet content it feels is “irrelevant” (see NY Senator proposing more censorship: Can this lead to Amos’ prophesied famine of the word?). But more than censorship will occur. A totalitarian attitude is getting more acceptance by leaders around the world–including the supposedly liberal West. And in a world where sites that disagree with the ‘politically correct’ are called “fake,” it is very dangerous. A totalitarian state dominated by Germany will rise up (see also Germany in Biblical Prophecy)–and the USA is assisting in this process (see also The Snowden Leaks are Leading to the Destruction of the USA). Plundering is the taking away of possessions, sword and flame are violent. The amount of fines now proposed by Germany sound like a plundering scare tactic. Bible prophecy shows that censorship, violence, and persecution will come from a totalitarian state. Yet, there is good news as the Kingdom of God will come and replace the Beast’s system (Revelation 17:14) that we see being put together today. 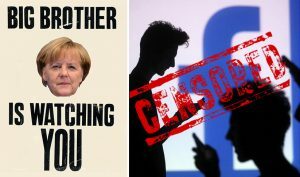 And yes, Zero Hedge is right to point out that the censorship and fining proposal shows an increasingly out-of-control Europe. One that will become a totalitarian society. This entry was posted on Saturday, April 8th, 2017 at 3:00 pm	and is filed under Prophecy.